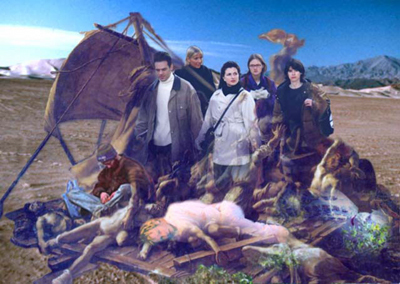 title of project: Gericault in the Desert - Photographic Suite Based on Romantic Painting. 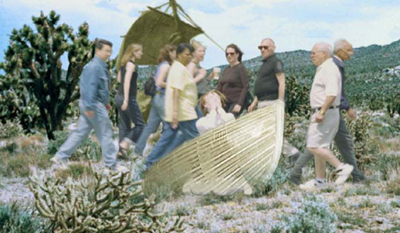 To produce a suite of large scale photographic images in the Mojave desert. 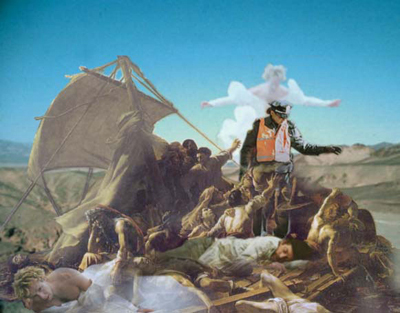 The pictures are loosely based on Gericault's famous painting 'The Raft of Medusa'. The images have a self-portraiture aspect, but I will also be accompanied by handful of models/actors. The project is a tool to engage further in a discussion about documentary tradition.I will do so by replacing the shipwrecked in the original image with homeless people wearing contemporary clothes. It is the aim of the proposed project to create staged photographs using myself as a model along with four to six actors. I want to do so by shooting images in the Mojave Desert loosely based on the composition of Gericault's famous painting 'The Raft of the Medusa'. The images have no intention of copying the painting, its composition, poses or gestures. The photographs are in no way paraphrases. I intend to use the image as a starting point in terms of content and disposition. The shipwrecked in Gericault's painting will be replaced by homeless in my interpretation. I want to retain a certain ambiguity about the circumstances surrounding the people depicted. Are they homeless or shabby looking professionals on the verge of emotional or financial ruin? I want to draw attention to certain aspects of documentary photography. The homeless, poor and the destitute have always been popular motifs in photography. This has historically been an important tool to draw attention to social problems. However, this practise has also given the photographers social and cultural stature. By putting myself in the centre of attention and staging the photographs I am able to engage in a discussion about these issues and questions about representation, authorship and authenticity. I have made some quick Photoshop collages to give a better understanding of the imagery that I have in mind, which are included in the application. These sketches are obviously playful, but at the same time bring to forefront the themes of context, anachronism, solitude and vulnerability and its cultural implications that I wish to address (see included images 1-5). In 1997 I started engaging in various photographic projects which used documentary traditions and merged them with elements from performance, earth and process art. Much of the work produced during this five year period dealt with representations of the exotic. The first representations of exotic themes in art history were produced by romantic painters in response to the burgeoning colonialism at the time. During a residency in Los Angeles in 2000 and 2001 I took the experiences from this work and started working with projects which explicitly took inspiration from writings by various romantic authors, such as Victor Hugo (see included images 6-7). What interested me in these writings were the representations of human vulnerability. As a natural development of this work I have lately taken up themes and compositions from romantic painting, primarily Caspar David Friedrich and moved these into a contemporary urban setting (see included image 8-10). I have for a long time had a strong urge to make photographic representations of my experiences of my relationship to the sea. What interests me is the implicit vulnerability and dangers that mankind has always faced in relation to the sea faring. During a work trip to Jordan I for the first time in my life visited a desert, which much to my amazement reminded me of the sea both in its vastness, openness and the way human vulnerability becomes visible. Snapshots that I casually took in the desert has reinstated this notion. I was reminded by this feeling when I recently visited the Louvre and saw Gericault's famous painting 'The Raft of the Medusa', which depict shipwrecked passengers afloat a raft. According to many writers, such as David Blaney Brown, Gericault used the story of the shipwrecked Medusa as a metaphor for innocent people suffering for public incompetence. In this I saw parallels to destitute people in our time in rich countries in Europe and the US. 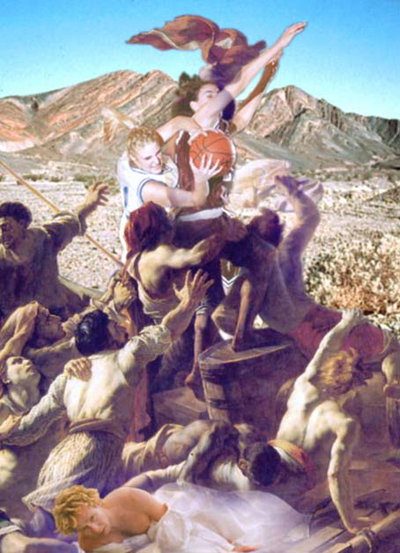 To create a suite of large scale images loosely based on The Raft of Medusa and to present them publicly. It is my aim that these images will further a discussion about documentary traditions, human vulnerability, visual representations and authorship which has been inherent in my work over the last years.